This article is about Mr. Game & Watch's appearance in Super Smash Bros. Ultimate. For the character in other contexts, see Mr. Game & Watch. Mr. Game & Watch (Mr.ゲーム＆ウォッチ, Mr. Game & Watch) is a playable character in Super Smash Bros. Ultimate. He was confirmed on June 12th, 2018. Mr. Game & Watch is classified as fighter #26. The sound effects used for Mr. Game & Watch have been reused from Brawl and SSB4. Play VS. matches, with Mr. Game & Watch being the 52nd character to be unlocked. Clear Classic Mode with Pikachu or any character in its unlock tree, being the sixth character unlocked after Isabelle. Have Mr. Game & Watch join the player's party in World of Light. With the exception of the third method, Mr. Game & Watch must then be defeated on Flat Zone X.
Mr. Game and Watch is a short, lightweight character that has some typical attributes of characters in his weight class. He has fast air speed, a small size, and a very low crouch that allows him to evade many attacks like Marth and Lucina's shield breaker and Simon's forward tilt. However, his walking and dashing speed are merely average. Unlike most other lightweights, Mr. Game and Watch possesses attacks with large disjointed hitboxes and has very powerful KOing options. All of his brutal smash attacks have very high power rivaling that of heavyweights and low lag throughout, with each of them possessing unique attributes. Forward smash is among the strongest in the game while having low startup lag and a lingering hitbox. Up smash is also very strong, and comes with full body invincibility during and after its duration. Like forward smash, it comes out quickly. Down smash sends opponents at an awkward semi-spike angle offstage, while its sweetspot burries opponents long enough to lead into a forward smash. It also has a very large hitbox, allowing it to easily catch recoveries in the 2-frame window. Overall, Mr. Game and Watch possesses arguably the best smash attacks in the game. They combine high power, low lag, large hitboxes, and other positive attributes like burrying and invincibility. Outside of his smash attacks, Mr. Game and Watch has strong KOing potential. Forward tilt comes out quickly, has a lingering hitbox, and kills under 120% by the ledge. Down tilt lowers G&W's hurtbox to match his crouch, allowing him to whiff-punish certain attacks. It also possesses high power and semi-spikes opponents offstage, leading to edgeguards and killing outright at 100%. His new Forward Aerial's explosion kills opponents at 115% by the ledge, while his down aerial has been strengthened to become a viable kill move around 130%. Similarly, his back aerial now sends at a flatter angle, and the final hit possesses enough power to kill at 100% by the ledge. Oil Panic, though nerfed, is still a potent combo finisher with little startup lag and a large hitbox, and still KOs early. Compared to most characters and even compared to his previous iterations, Mr. Game and Watch possesses very strong KOing power that rivals heavyweights. G&W also has a very potent combo and juggling game. Down throw, though nerfed, still combos into Oil Panic, Judge, and neutral air at low percent. Chef has been buffed to the point where it deals massive damage if multiple 'food' items hit and also comboing into forward tilt and forward air. Up tilt, though having worse range, deals high damage and combos into neutral air at low percent. Once G&W has his opponents above him, he can juggle them for massive damage using his up and neutral aerials. All in all, G&W's strong KO power is supplemented with high damaging combos and juggles. Lastly, Mr. Game and Watch possesses a fantastic recovery option with large, disjointed aerials. This means that he is a formidable edgeguarder and is extremely hard to gimp. His up special, Fire, has frame 3 startup, invincibility, and a strong upwards hitbox. This makes it deadly to stagespike opponents while also gimping characters with poor recoveries, like Chrom, easily. It is also an extremely useful combo breaker and out-of-shield option due to its fast startup and invincibility. His feared back air, Turtle Bridge, is large and disjointed multi-hit move that has high knockback at the final hit. For many characters, getting hit with Turtle Bridge is fatal offstage. On the ledge, Chef punishes ledge hangers and covers getup attack and rolls (hit by the pan), forcing opponents to jump. His new forward air, Bombs Away, can be comboed into with Chef and has strong KO potential on its own. All in all, Mr. Game and Watch is extremely deadly off the level and at the ledge to all characters. Despite these strengths, Mr. Game and Watch possesses very large weaknesses. He is among the lightest characters in the game, which makes his horizontal and vertical endurance among the worst in the game. In addition, despite having disjoints, his overall range is merely average. This is worsened by many of his disjoints, like down tilt, up tilt, and forward smash possessing less range. This makes characters like Ike and Cloud easily able to keep G&W at arm's length. Also, while his new forward air possesses more damage and knockback, it disappears if it comes into contact with any other hitbox. This makes it unsuitable for approaching and forces G&W to approach with his back air constantly. Mr. Game and Watch also possesses a laggy grab and lacks any useful throws outside of his down throw. None of his other throws lead into combos or possess KO power. Finally, G&W's rolls, techs, and spotdodges are slow, laggy, and very punishable. Combined with his low weight, they are often too risky to use effectively. All in all, Mr. Game and Watch is a very powerful glass cannon. He possesses extremely high damage output and powerful KO options while being extremely vulnerable himself due to his light weight and laggy defensive options. Mr. Game and Watch - in a similar fashion to characters such as Zelda and Link - has received an overhaul in his entire moveset that goes beyond changes to aesthetic appearances. A majority of his moves have been altered in range, damage, knock back, lag, or have been completely reworked altogether, leading to a majority of buffs, along with a few major nerfs. Mr. Game and Watch's KO potential has been improved. A majority of his regular moves, including forward tilt and down tilt, have much stronger knockback, with the latter now capable of KOing as early as 100%. The ability to dash cancel improves the utility of these attacks further, and now gives Mr. Game and Watch quick KO options he didn't have access to SSB4. To further add to this, his smash attacks are stronger as well. Down smash has significantly improved as it now has much less start-up and is also capable of burying opponents when sweetspotted. This can lead to a forward smash for early guarantee KO setups. Forward smash also has improved knockback, and is easier to sweetspot, making it a more potent punishing move. Lastly, Up Smash remains one of the strongest of the whole cast. Mr. Game and Watch has gained a new forward aerial: An attack in which he drops a bomb in front of him, a move based off of his game Mario's Bombs Away. Compared to his old aerial, the move's explosion has stronger knockback and damage output, making it a more reliable KO move than his old forward aerial. Mr. Game and Watch's edgeguarding potential has also been buffed considerably. Back aerial and down aerial are stronger, leading them to become stronger options to punish opponents who are offstage. Chef's trajectory can now be controlled, which makes it easier to catch opponents who are trying to reach for the ledge and is now more effective keeping control of neutral. Lastly, Mr. Game and Watch's new forward aerial's explosion can cover the entire ledge of a stage, making it a more potent option than his old forward aerial, and the bomb itself is good to use against an opponent offstage. Additionally, Mr. Game and Watch now possesses stronger OoS options and juggling tools. Changes to Neutral aerial's landing lag and lingering hitboxes allow it to catch opponents above him more effectively, and can even it allow it to combo into itself at lower percents. Mr. Game and Watch has gained a new up air, in which he shoots a projectile upwards in the form of a single puff, functioning very similarly to Mega Man's up air. This projectile has much more range than his old up air, and is more reliable for keeping opponents trapped in it, making them stay longer in the air. Fire now has a frame 3 hitbox that replaces its windbox from SSB4, making it a much stronger OoS, and can even be followed up with a neutral air or up air to keep opponents in the air for even longer. Lastly, a few of his attacks have more utility overall: Oil Panic can now reflect physical projectiles in addition to absorbing energy-based projectiles, and Judge's numbers 7 and 8 have improved. However, Mr. Game and Watch received a few notable nerfs. His two most potent strengths from SSB4 - his up smash and down throw setups - have been toned down considerably. Down throw now deals much more knockback, removing a lot of its follow-ups at higher percents; this, combined with the change to his up aerial, effectively removes his strong (though inconsistent) combo from SSB4, dubbed the "Toot Toot", where he would follow up a down throw with an up air. Despite the start-up reduction to up smash, it has lost all of its invincibility frames during the move's start-up, making it much less effective as an anti-air, and allows opponents to challenge it easier. Lastly, Mr. Game and Watch has now received in increase in lag on a few of his attacks, including forward aerial, down tilt, and Chef, making it easier for opponents to punish them. Overall, Mr. Game and Watch has received buffs that increase the utility of many of his attacks that were generally undertuned in SSB4, while also receiving nerfs that worsen his key strengths from the previous game. Competitive reception of Mr. Game and Watch has been mixed overall. Some notable players such as Dabuz and Cosmos view him as a high tier character. On the other hand, notable players such as ESAM, ZeRo, and Tweek, view him as a low tier character and worse than his SSB4 counterpart. Notably, ZeRo considers G&W as the 2nd worst character in the game. Despite this claim, Mr. Game and Watch has seen success thanks to the efforts of players including Maister, Regi, Paper, twerkmastr, and Dingus Joe. Maister placed 3rd at Full Bloom 5, defeating top level players like ESAM and MVD while taking Cosmos and Marrs to game 5. Dingus also placed 25th at Glitch 6, and Regi placed 33rd at GENESIS 6. This implies that the claims calling G&W low tier were not based off sound evidence and should not be taken at face value. Neutral attack (Greenhouse), forward tilt (Lion), up tilt (Flagman), down tilt (Manhole), forward smash (Fire Attack), down smash (Vermin), up aerial (Spitball Sparky), all throws (Ball), Chef, Judge and Oil Panic. Like in Melee, Mr. Game & Watch now makes a noise when getting KOed, and he also has a new sound for getting Star KOed. Both use the sound of his up and side taunts. Mr. Game & Watch's walking animation has been changed; now looking less flippant. Mr. Game & Watch has a new victory animation where he juggles balls using his appearance from Ball. This replaces the victory pose where he jumps up and down. Mr. Game & Watch's mouth is open during his clapping animation, similar to his Melee appearance. Due to the universal buff to all characters, Mr. Game & Watch's jumpsquat animation now takes three frames to complete (down from 5). Mr. Game & Watch dashes faster (1.5264 → 1.679). Mr. Game & Watch's initial dash is significantly faster (1.5 → 1.98). Mr. Game & Watch walks slightly faster (1.1242 → 1.18). Mr. Game and Watch's traction has been significantly increased (0.06 → 0.131), now tied for the 5th highest in the entire game. Mr. Game & Watch's air speed is slightly higher (1.12 → 1.176). Spotdodge has slightly increased start-up lag (frames 2-16 → 3-17). Spotdodge has reduced endlag (FAF 26 → 22). Forward roll has slightly more endlag (FAF 30 → 31), and a shorter duration (frames 4-16 → 4-15). Backward roll has more endlag (FAF 30 → 36), slightly increased start-up lag, and a shorter duration (frames 4-16 → 5-16). Neutral air dodge has slightly increased start-up lag (frame 2 → 3) and significantly increased endlag (FAF 32 → 60). Neutral air dodge has a slightly longer duration (frames 2-26 → 3-28). Neutral air dodge has less landing lag (22 → 10 frames). Mr. Game & Watch's new animations result in many of his moves having less favorable disjoint and hurtbox sizes. Neutral attack no longer pushes Mr. Game & Watch as far back as previously. Neutral attack can now jab reset. Rapid Jab Finisher deals more damage (2% → 3%), without full compensation to the knockback. Rapid jab's infinite hits deal less damage (1% → 0.8%). Rapid Finisher has more endlag (FAF 24 → 35). Forward tilt deals more damage (10%(clean chair)/9%(clean body)/4%(late) → 12%/10%/6%). Forward tilt comes out sooner, and has a longer duration (10-17 → 8-20). Forward tilt deals more knockback. Forward tilt has reduced range. Up tilt has intangibility on both hands. Up tilt has less endlag (FAF 36 → 34). Up tilt has Flag 1 and Flag 2 appear on each side of Mr. Game & Watch instead of above. While this increases its horizontal range, it effectively removes any anti-air potential it had. Down tilt deals more damage (6% → 9%) and has increased base knockback (40 → 45). This significantly increases its knockback overall, despite having its knockback growth reduced (125 → 112). Down tilt's animation change results in Mr. Game and Watch having a smaller vertical hurtbox. Down tilt has increased endlag (FAF 40 → 43). Down tilt is no longer nearly as disjointed, and has significantly less range. Down tilt has a shorter duration (frames 6-11 → 6-8). Down tilt's windbox has been removed. This disallows for juggling with windboxes, and potential recovery interruptions (such as when used against Ike's Quick Draw). Due to Mr. Game & Watch not being animated while charging his smash attacks, the new smash attack charging mechanics make it difficult to tell when they are fully charged. Forward smash's sweetspot knockback growth has been increased (91 → 97), improving its overall knockback despite having reduced base knockback (48 → 46). Forward smash sourspot angle is now slightly lower (53 → 48). Up smash has less start-up lag (frame 24 → 21). Up smash has a longer duration (frames 24-25 → 21-25), much like its Brawl iteration. Up smash's invincibility frames now cover Mr. Game and Watch's entire body. Up smash deals slightly more knockback. Up smash's invincibility frames have now been changed from before attacking, to during the active attack frames (frames 4-25 → 21-25). This reduces its use as an effective anti-air. Down smash now has the ability to bury opponents if the move is sweetspotted. Down smash has less startup lag (frame 15 → 12), and less endlag (FAF 42 → 38). Neutral aerial, back aerial, and down aerial have less landing lag (12 → 7 frames (neutral), 19 → 18 frames (back), 28 → 22 frames (down)). All of neutral aerial's hitboxes have significantly longer durations (frames 7/12/17/22 → 7-10/12-15/17-20/22-25), much like its Brawl iteration. It auto-cancels earlier (frame 44 → 42). Neutral aerial now deals less overall damage (5% (hit 1)/4% (hit 2)/4%(hit 3)/4% (hit 4)/17% (overall) → 3%/3%/3%/4%/13%). The final hit deals less knockback, reducing its KO potential; however, this, along with neutral aerial's reduced landing lag, allows the move to combo into itself more effectively at lower percents. Mr. Game & Watch has a new forward aerial (based on the Game & Watch game Mario's Bombs Away) in which he holds a bomb in front of him and drops it downward shortly after execution. Uniquely, once activating the move, the previously mentioned bomb is used as a projectile, as it is sent directly downwards, exploding on a half a second afterwards or when it hits the stage. This significantly improves the move's range and gives another edgeguarding option. The bomb does not explode upon hitting an opponent, and any attack that hits it will cause it to disappear. New forward aerial deals more damage when both hits connect (11.5% → 15%). Forward aerial's explosion deals more knockback. Forward aerial has more landing lag (15 → 17 frames) and end lag (FAF 45 → 48). It's initial auto-cancel window has been removed. Back aerial's landing hit now sends more horizontally, while he can no longer link another back aerial, sending targets into an edgeguarding scenario is now easier. Back aerial's final hit is now stronger, being a more reliable KO move. Up aerial has been reworked: it now functions as a projectile, similar to Mega Man's up aerial, Air Shooter, and hits six times. Up aerial has increased range. Up aerial consists of 5 hits as opposed to 2, and as a result, has a significantly longer duration (frames 6-12/20-22 → 9-14/16-21/23-28/30-35/37-42). Up aerial is a single puff of air, making it easier to land, since the opponent can't be juggled out of the second finishing hit. Up aerial is significantly weaker, no longer being a reliable KO move. Up aerial does less damage when all hits connect (7% (hit 1)/9% (hit 2)/16% (total) → 2.4% (hits 1-5)/12%). Up aerial has increased start-up (frame 6 → 9) and endlag (FAF 40 → 43). It auto-cancels later (frame 41 → 44) and no longer has an initial auto-cancel window. Up aerial's windbox has been removed, preventing the ability to juggle opponents when they are helpless. Down aerial has increased knockback. It auto-cancels earlier (frame 51 → 49), matching the move's interruptibility and allowing the move to auto-cancel after a full hop + Fire. Dash grab and pivot grab have increased start-up lag (frame 8 → 9 (dash), frame 9 → 10 (pivot)), and all grabs have increased ending lag (FAF 30 → 35 (standing), FAF 37 → 43 (dash), FAF 35 → 37 (pivot)). When a character is thrown by Mr. Game & Watch, they will turn into their respective stock icon for the duration of the juggle. Pummel is much faster, but is also much weaker overall (3% → 1.3%). Up throw deals considerably more damage (8% → 12%). During the down throw animation, Mr. Game & Watch "drops" the character's icon. Down throw deals significantly more knockback, giving it worse follow-up potential. However, due to this, down throw is now a KO option at higher percents. Chef deals significantly more damage (5% → 8% (pan), 3% → 5% (sausages)). Chef's food trajectory can be controlled. Chef has more endlag (FAF 50 → 55). Judge's numbers now appear in a jumble, before settling on the decided number. Judge can no longer roll the same number twice in a row. Judge 7 now spawns three apples instead of one, allowing him to heal significantly more health once using the move, but also allowing the opponent to heal on block or armored hit. Judge 7 launches at a higher angle, and deals slightly more knockback. Judge 8 does more damage (9% → 13%), which makes the freeze effect last longer. Judge 9 now triggers Special Zoom. Fire's windbox has been replaced with a frame 3 hitbox. Fire's new frame 3 hitbox gives it more potential as a out of shield option and combo breaker than before. Fire now transitions into the parachute slightly faster (FAF 41 → 37). Bucket Jumping returns from the previous title, increasing Mr. Game & Watch's horizontal recovery. Oil Panic now reflects physical projectiles in addition to absorbing energy-based projectiles. Oil Panic now begins absorbing 1 frame earlier (7 → 6). Oil Panic has reduced endlag (FAF 50 → 44). Oil Panic's loop has been standardized, allowing Mr. Game & Watch to immediately go into the recovery animation when the B button is released after frame 30. Mr. Game & Watch is no longer forced into another loop of Oil Panic after absorbing a projectile if the B button is not being held. He also isn't put into the move's recovery animation, allowing him to act the moment intangibility ends. Mr. Game & Watch can no longer absorb projectiles during the recovery animation of Oil Panic, making him unable to do lagless absorptions. Oil Panic's damage multiplier has been reduced (2.8x → 2.0x). Oil Panic's minimum and maximum damage has been reduced in both respects. Minimum damage decreased (18% → 17%). Maximum damage decreased (60% → 48%). Oil Panic deals significantly less knockback, further hindering it's OHKO potential, and making it's less strong variants unsafe on hit. Oil Panic's attack portion no longer has intangibility on frames 1-6. Oil Panic triggers Special Zoom on any successful hit, and leaves the opponent covered in oil for a brief moment. Octopus's use has been altered. The octopus now rears back and charges forward, grabs opponents who touch its tentacles, and drags them offscreen. The main body deals damage instead of the tentacles. While this increases its KO potential, it also reduces its range, mobility and duration. A greenish-beige backdrop similar to that of a Game & Watch game temporarily appears during this Final Smash. The feather from Mr. Game and Watch's forward smash animation was removed. Forward aerial's explosion hitbox has increased range, matching the visual explosion more closely and allowing the move to catch opponents from below the ledge. This improves its edgeguarding potential. Down aerial auto-cancels earlier (frame 51 → 49), matching the move's interruptibility and allowing the move to auto-cancel after a full hop + Fire. Up Aerial's location reassignment glitch has been removed. Oil Panic's grounded mobility glitch has been removed. Down Taunt's air puff now correctly vanishes and reappears when interrupted. Octopus traps opponents for a longer period of time. Several basic animations, such as idle and crouch animations, have been adjusted. Green House 3% (first and last hit) Rapidly presses an insecticide pump, pumping gas onto the opponent. Unlike other characters, Mr. Game & Watch's rapid jab slightly pushes the opponent away. The first hit can be used to setup for a grab; the finisher starts KOing middleweights by the ledge at around 150% on Final Destination. Changes Mr. Game & Watch's model into his appearance from Greenhouse. Lion 12% (clean chair), 10% (clean body), (6% (late) Thrusts a chair forward to hit with its legs. Its hitbox lingers, making it effective at catching spotdodges, and the strong hit kills Mario at 110% by the ledge. Changes Mr. Game & Watch's model into his appearance from Lion. Flagman 7% (hits 1 and 2) Mr. Game & Watch swings a flag in front of him, and a flag behind him. The first hit knocks the opponent into the second one. While the horizontal range has increased, it effectively loses any anti-air potential it had previously. No matter what side he faces, Flag 1 and Flag 2 will always be on the left and right sides, respectively. If this move is used twice in succession, with the second use facing the opposite as the first, the numbers (albeit being mirrored) will switch sides. Changes Mr. Game & Watch's model into his appearance from Flagman. Manhole 9% Pushes an angled manhole in front of himself. Does more damage than in the previous game and has much more knockback at the expense of increased endlag and reduced range. Down tilt also loses its windbox, disallowing juggling and potential recovery interrupting. Very fast startup at frame 6 and kills at 95% by the ledge and 130% centre stage. Changes Mr. Game & Watch's model into his appearance from Manhole. Helmet 10% (clean), 6.5% (late) Performs a sliding headbutt while wearing a helmet. It has good range and is very fast, sliding Mr. Game & Watch forward in a choppy frame-by-frame manner, making it difficult to react to. This move is a tool for both risky approaching and safe punishing. Low ending lag, good knockback, and high amount of active frames make it a decent KOing option near the edge and useful for edgeguarding before an opponent can grab the edge. Originates from Helmet. Fire Attack 14% (handle), 18% (flame) Swings a lit torch downward. The sweetspot is at the flame, while the sourspot is at the torch. Has a disjointed hitbox with potent knockback, while not being particularly slow. Its sweetspot KOs middleweights at 65% by the ledge, while its sourspot KOs at 85%. Changes Mr. Game & Watch's model to the character from Fire Attack. As of update 1.1.0, the feather on his head was removed. Octopus 16% Performs an upward headbutt while wearing a diving helmet. The move has noticeable start-up, coming out on frame 21, but has an extremely low cool down of only 13 frames and a deceptively long duration of 5 frames, making it a reliable baiting tool. While his whole body gains invincibility, it only lasts during and after the move. Extremely high knockback KOing middleweights at 85% uncharged and 60% fully charged. Originates from Octopus. Vermin 13% (body), 15% (hammers) Swings two hammers downward and on both of his sides. Has the fastest start-up of all of Mr. Game and Watch's smash attacks, coming out on frame 12, and possesses extremely fast interruptibility, ending on frame 37, as well as a disjoint in the form of the hammers themselves. When sweetspoted, it will bury opponents, which can be followed up with a forward smash, down tilt, or forward tilt. Its sourspot sends opponents at a semi-spike angle and kills at 120% by the ledge. As a result, it has become one of Mr. Game and Watch's most reliable KO'ing options. Changes Mr. Game & Watch's model into the character from Vermin. Tropical Fish 3% (hits 1- 3), 4% (hit 4) Tosses out a pair of fish from a bowl. Multiple hitboxes enable it to cover every area except below him. At lower percents, it can combo into itself multiple times, making it a reliable combo tool and damage racker. very At higher percents, landing with the weak hits can set up for a KO confirm into down tilt. Originates from Tropical Fish. Bombs Away 3% (bomb), 12% (explosion) Holds a bomb in front of him, dropping it downward shortly after execution. The dropped bomb acts as a projectile, as it is sent directly downwards, exploding on a half a second afterwards or when it hits the stage. As of update 2.0.0, the entirety of the explosion's radius contains the hitbox. The bomb does not explode upon hitting an opponent, and any attack that hits it will cause it to disappear. There is a weak hitbox on the bomb (shortly before Mr. Game & Watch drops it) that slightly pushes midair opponents downward. Even at 999%, the weak hit has no KO power. Hitting grounded opponents with the first hit will set them up to be hit by the second. Kills at 115% by the ledge. Originates from Mario's Bombs Away. Turtle Bridge 2% (hits 1 - 3), 3% (hit 4) Swings a snapping turtle behind himself. A fully disjointed hitbox that hits multiple times. Although it can't combo into itself anymore, it's final hit is much stronger, making it a more reliable KO move. Originates from Turtle Bridge. Spitball Sparky 2.4% (hits 1 - 5) Shoots a single puff of air upward. Similar to Mega Man's up aerial, it acts as a projectile, hits multiple times, and pushes opponents upward as it rises. It has much more damage-racking and juggling capabilities than his SSB4 up aerial at the expense of losing all of its KO power. The move now has Mr. Game & Watch's model look more like his appearance in Spitball Sparky. Donkey Kong Jr. 11% (key), 3.5% (landing) Drops downward while holding a key beneath himself. A stall-then-fall, it meteor smashes powerfully on the first frames. It can be moved left or right slightly during descent. While it can potentially cause Mr. Game & Watch to self-destruct while using it off-stage, his effective recovery, coupled with it's low endlag and the move being being slower than other stall-then-falls makes this unlikely. It is a safe option when edgeguarding and has KO potential at high percents, killing at 130%. Originates from the Game & Watch version of Donkey Kong Jr.
— Mr. Game & Watch reaches in front of himself. Originates from Mario's Cement Factory. Alarm 1.3% Hits the opponent with a bell. Originates from the Game & Watch's alarm feature. Forward Ball 8% Juggles the opponent and tosses them forward. Changes Mr. Game & Watch's model into the character from Ball. Backward Ball 8% Juggles the opponent and tosses them backward. Changes Mr. Game & Watch's model into the character from Ball. Vertical Ball 12% Juggles the opponent and tosses them upward. Can be followed up with Fire or up air at low percents. Changes Mr. Game & Watch's model into the character from Ball. Drop Ball 4% Juggles the opponent and drops them on the ground behind him. Launches opponents upward. Mr. Game & Watch’s only KO throw, but still does not KO middleweights until around 200%. At low to mid percents, it's a reliable combo starter, and can be followed up with neutral air, Judge, Fire, or up air. Changes Mr. Game & Watch's model into the character from Ball. 7% Swings a hammer downward in front of himself and then behind himself. Originates from Vermin. 7% Swings a hammer downward in behind himself and then in front of himself. Originates from Vermin. 5% Swings a hammer downward in front of himself and then behind himself. Originates from Vermin. 9% Swings a bell forward while climbing up. Originates from the Game & Watch's alarm feature. Chef 5% (food), 8% (frying pan) Flips food out of a frying pan, moving slowly through the air. The trajectory can be controlled by tilting the stick forward and/or backward. By tapping the button, the food will be flung at a faster frequency. The food can be used defensively to cancel attack animations of opponents as a zoning tool as well as to prevent aerial approaches and can be used for edgeguarding against opponents with linear recoveries. Hitting with the pan itself deals flame damage, and acts as a semi-spike. Mr. Game & Watch's model changes into his appearance from Chef. Judge Varies Swings a hammer in front of him, and raises a flag with a random number from 1-9 with his other hand. It can have any one of 9 effects, which vary based on number; 1 only damages himself, while 9 is a is strong enough to be a virtual one-hit KO. Mr. Game & Watch's model changes into his appearance from Judge. Judge 1: An extremely weak swing that does not make the opponent flinch. It is the least damaging Judge attack and deals 12% recoil damage regardless of whether or not it hits. Judge 2: A weak swing that deals minimal knockback. It has a 20% chance of tripping the opponent. Judge 3: A weak swing. It sends opponents in the opposite direction from where Mr. Game & Watch is facing. It deals significant shield damage. Judge 4: A swing that has a slash effect and launches opponents diagonally forward. Judge 5: A swing that has an electric effect and hits multiple times. Judge 6: A swing that has a flame effect and is a semi-spike. Has the second strongest knockback of all Judge attacks. Judge 7: A swing that deals moderate knockback and produces 3 apples if it hits the opponent. Each apple heals 4%. Judge 8: A swing that has a freeze effect and deals very low knockback. Emits the "ping" sound effect that is usually associated with one-hit KOs. Judge 9: An extremely powerful swing that deals very high knockback. It is the most damaging Judge attack and emits the "ping" sound effect like Judge 8. Similar in nature to a charged swing from the Home-Run Bat, but the hit's base knockback is much lower, which makes it generally unable to KO at extremely low percents. When used fresh, will KO every character in the game at 0% at the edge of Final Destination. Fire 3% (trampoline; firemen), 6% (ascent) Jumps off a trampoline and then descends while wearing a parachute. Capable of canceling into any move when falling. Has KO potential at high percents near the left and right blast lines. Very good at stage spiking, due to out-prioritizing most aerials because it being basically invincible on startup, and dealing strong knockback, making Mr. Game & Watch very difficult to edgeguard. Originates from Fire. Oil Panic Based on absorbed attacks Holds an oil drum, which absorbs energy-based projectiles, and reflects physical ones. Once three units are absorbed, it turns into a powerful attack consisting of Mr. Game & Watch sending out a large splash of oil from his oil drum. No matter the strength of the oil, this move will always trigger Special Zoom. Can kill starting at 15% and comes out extremely fast (frame 2 startup). Any opponent hit will be covered in oil for a brief moment. Mr. Game & Watch's model changes into his appearance from Oil Panic. Octopus 4.9% (grabbed), 15% (body), 30% (slam) Transforms into the large octopus that appears in its eponymous game, Octopus, rears back and charges forward. The octopus can move up or down, only. Any opponents who touch its tentacles will be grabbed and dragged offscreen by the octopus, taking gradual damage. Touching the main body will just deal damage. Just like in the previous game, pressing the attack button will extend the length of the tentacles. By button-mashing, however, opponents can escape. The octopus can also go through walls and stages; any grabbed opponents who make contact with walls or floors will take damage and be launched. After reaching the blast line, Mr. Game & Watch will return back to his previous position. Moves along a row of Game & Watch LCD frames until reaching the foreground. Up Taunt: Rings his bell at a high angle. Similar to his side taunt, it originates from the Game & Watch's alarm feature. Side Taunt: Rings his bell at a low angle. Similar to his up taunt, it originates from the Game & Watch's alarm feature. Down Taunt: Sits down and catches his breath. Originates from the Game & Watch version of Mario Bros. when Mario and Luigi finished a level. Rings his bell to his left, then his right. Afterwards, he continues to ring his bell to his left. Hops about in choppy poses, tripping halfway, before teetering on one foot. He then proceeds to jump back and forth, landing on his feet, then his head. Juggles 3 balls while in his appearance from Ball. An original melody with an energetic tempo, based upon the typical bleeping noises that characters or other objects in a Game & Watch would make. Dingus Joe - Placed 2nd at The Grind 64 and 25th at Glitch 6. Maister - One of the best Mr. Game & Watch mains in the world. Placed 2nd at Retro Arena 64 and has wins over Ned and Bushi. Regi Shikimi - Currently the best Mr. Game & Watch main in the world. Placed 33rd at GENESIS 6. Mr. Game & Watch fights classic characters on retro stages. They are fought in reverse order of release dates. 4 Mario and Luigi Mario Bros. Ground Theme - Super Mario Bros.
5 Donkey Kong 75m 25m Mario is a CPU ally. Master Hand / Crazy Hand (7.0 or higher intensity) On intensity 7.0 and higher, Crazy Hand fights alongside Master Hand. Although Mr. Game & Watch does not appear in the World of Light opening cutscene, he was vaporized and later imprisoned alongside the rest of the fighters (sans Kirby) when Galeem unleashed his beams of light. Mr. Game & Watch is unlocked in the maze area of the Light Realm. After finding the correct path through the maze, the player must defeat the Sidestepper and Nikki spirits in front of his unlock battle. Mr. Game & Watch's Fighter Spirit can be obtained by completing Classic Mode. It is also available periodically for purchase in the shop for 500 coins. Unlocking Mr. Game & Watch in World of Light allows the player to preview the spirit below in the Spirit List under the name "???". As a Fighter Spirit, it cannot be used in Spirit Battles and is purely aesthetic. Each Fighter Spirit has an alternate version that replaces them with their artwork in Ultimate. Num Diddly Make 10: A Journey of Numbers •Mr. Game & Watch Team (×4) Shield 2,000 PictoChat 2 •Assist Trophy Enemies (Dr. Kawashima) •Hostile assist trophies will appear Menu - Brain Age 2: More Training in Minutes a Day! Mr. Game & Watch's fighter card. Mr. Game and Watch's up taunt on Town and City. Being attacked by Ryu on Suzaku Castle. Using his down smash on King Dedede and Sheik on Yoshi's Story. Using Judge 1 on Duck Hunt on Tortimer Island. Four of Mr. Game and Watch's alternate costumes on Flat Zone X. Using Chef near Pac-Man on Tortimer Island. Mr. Game & Watch's forward smash, derived from Fire Attack, pre-patch and post-patch. This is the first game in the series where Mr. Game & Watch is portrayed holding an object different than his signature bell in his official art, instead being shown holding the flag from Flagman (the same one as his up tilt). 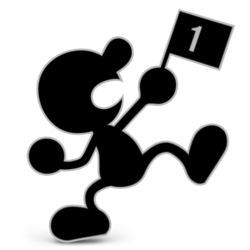 In-game, however, Mr. Game & Watch changes his appearance to match the character in Flagman, rather than using his own appearance. Mr. Game & Watch's render pose somewhat resembles his Smash 4 render, although mirrored, and the positioning of his legs has been mirrored. It is also the first time in the series where his render pose shows him facing right instead of left. During the launch of Ultimate's official website, Mr. Game & Watch's name was erroneously labeled as "Mr. GAME & WATACH" exclusively on the mobile variant of his fighter page. The typo was later corrected. Mr. Game & Watch's stock icon in Ultimate bears a strong resemblance to his stock icon from Super Smash Bros. 4. His official art, apart from looking like his old up tilt, also resembles his Alt. trophy in Super Smash Bros. for Nintendo 3DS. In Pikachu's showcase trailer, Mr. Game & Watch is seen using his forward smash animation from Smash 4. However, it was later changed to reference its origin game (Fire Attack) like some of his other moves. This change attracted criticism for its portrayal of a Native American stereotype (itself sourced from the original version of Fire Attack); Nintendo of America responded to the criticism by apologizing for the outdated imagery and promising to alter it by removing the feather from Mr. Game & Watch's model, matching a change seen in the Game & Watch Gallery 4 version of Fire Attack. The Fire Attack spirit also had its artwork altered in the same patch as well, removing the feather. Although Mr. Game & Watch has no visible eyes in his neutral animation, the loading screen, which temporarily glows the selected character's eyes, makes Mr. Game & Watch glow where his eyes would be. The same applies to his Final Smash activation picture, which focuses on where his eyes would be, as with other characters. Mr. Game & Watch is one of the few characters in Ultimate to lack voice clips in the Sound Test. This is probably because the game considers his various beeps as sound effects instead. In spite of other languages having a translated word for the term "Mr.", no other language uses it in Ultimate for Mr. Game & Watch's name except for Russian, appropriately using "Г-н". Mr. Game & Watch's "transformation" into other Game & Watch characters are fully 2-D, unlike his regular model. This can be seen when under the effect of a metal box. Despite this, the manhole in Mr. Game & Watch's down tilt is still rendered in 3-D.
Mr. Game & Watch is one of six characters to use their default costumes in certain Spirit Battles, the others being Yoshi, Bowser Jr., Inkling, Joker and Robin. This is not counting Alph, and all gender swapped characters. Mr. Game & Watch is also the only one of these characters to use his default costume in more than one Spirit Battle. As a consequence of not having visible eyes, Mr. Game & Watch is the only character with puppet fighters in World of Light that lack their signature red eyes, simply using his model and various alternate costumes with no alterations. One of the tips states that he is the 3rd lightest character in the game. He is actually tied with Squirtle in this ranking, as they have the same weight value of 75. This page was last edited on April 21, 2019, at 19:25.